Imagine a supportive employer, a career that fits your lifestyle, and endless learning opportunities. With AHS, you can have all of that, and more. We strive to empower our employees, and work together to create an environment where everyone can succeed. From nurses to power engineers, housekeepers to physiotherapists, and numerous other careers, there’s a place for you here. No matter what your role, working with us is about making a difference – every day. We offer a variety of educational opportunities. We believe in developing our workforce and bringing your potential to life. Join a team that has pioneered ground-breaking technology, medical advancements, and conducted cutting-edge research. From bringing a new baby into the world to caring for seniors, we share your commitment to making a difference and improving lives. Our medical, clinical and support staff is recognized by peers as among the most passionate, talented and respected in the country. We’re committed to work/life balance and offer benefits and resources such as the Employee and Family Assistance Program to help our people thrive. We’re province wide - giving you the opportunity to find a workplace that fits your skills and a community that fits your interests. We have been recognized as one of the Top 70 Employers in Alberta, Top 100 Employers in Canada, as well as, a Top Employer for Young People, and Top Employer for Diversity. These awards are a strong endorsement of the care provided to Albertans by our staff, physicians and volunteers every day. Join the conversation on social media by using the hashtag #Top100AHS and tell us what makes AHS the best employer. 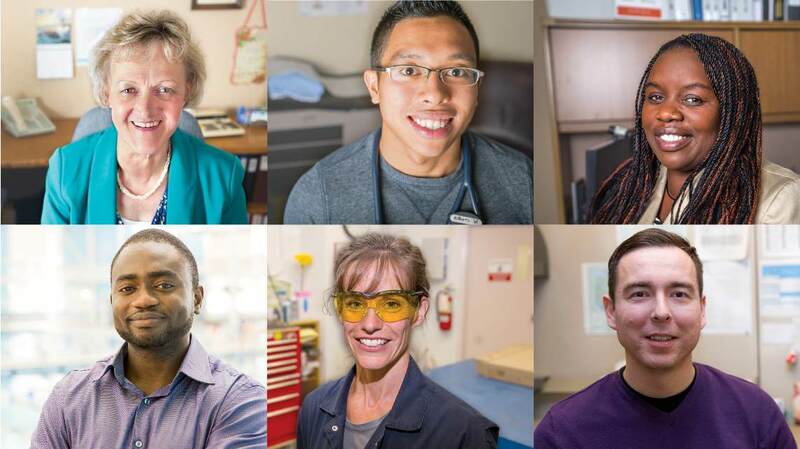 See why our employees love their job – in their own words. Find out what drew them to healthcare, what brought them to AHS, and why they stay. You’ll also learn about the patients, families, and staff they work with. Our five values – compassion, accountability, respect, excellence and safety – are at the heart of everything we do. We strive to clearly and consistently communicate respect for all individuals so that, everyone can feel safe, healthy, and valued. Our People Strategy is about creating a culture in which everyone feels safe, healthy, and valued, and can reach their full potential.